So, back in April, I decided it was time to buy a new mower. I found a Craftsman at Sears that seemed to be pretty good and it was a good price. I bought it, used it a couple of times, then the drought hit. I haven’t used it in about two months. Then, the drought broke. My yard turned green again and I headed out to mow. The mower wouldn’t start. Yeah. Little pissed. I called Sears and they told me to bring it in. Unfortunately, the Sears at Crossroads Mall doesn’t take repairs, so I had to go to either Battle Creek or Three Rivers. Since they’re pretty close to the same drive, I went to Battle Creek. 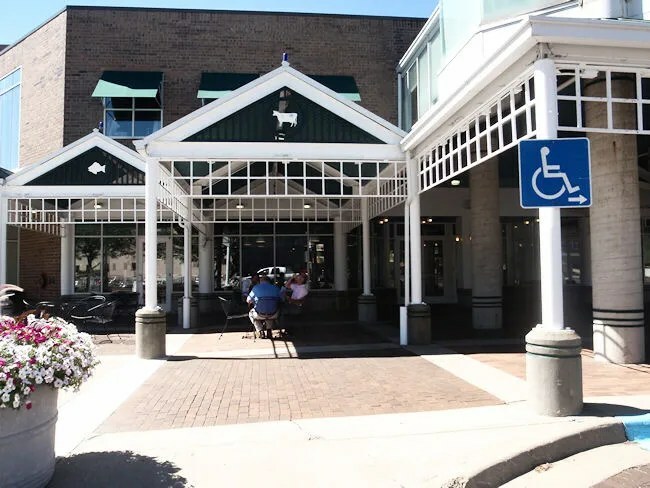 After dropping it off and finding out it would take 10-15 days to repair, I walked around the Lakeview Square Mall waiting for 11:00 when restaurants in the area started opening. A little after 11, I got L back in her car seat and headed towards downtown. A deli in McCamley Plaza has been sending me email specials and right there in their name, a food that I love. Pastrami Joe’s has two Calhoun County locations. One in Marshall. One on Jackson Street in downtown Battle Creek. The Battle Creek location is attached to the McCamly Plaza Hotel. There is an outside entrance with very little signage other than a sandwich board on the sidewalk. From the inside, there’s a little awning with the deli name. I ended up making two separate trips to Pastrami Joe’s. I texted J a menu to see if she wanted anything. She didn’t reply, so I just ordered for myself and left. As I was pulling out of the parking lot, I got a text back. Since I was still in the area, I went around the block and back in. The deli is set up with both inside and outside seating. Being right across the street from Kellogg, I wasn’t surprised to see a lot of business types on their lunch break. On my first trip, I ordered for myself. I didn’t even really look at the menu. I knew I wanted the Pastrmi. I quickly scanned the menu board to find the #10. “Joe’s Soon To Be Famous Pastrami” is Gold Label Naval Pastrami with sliced dill pickles and hot mustard on rye bread. I went with the large which is the whole sandwich. The cost is a little over $8 after tax. 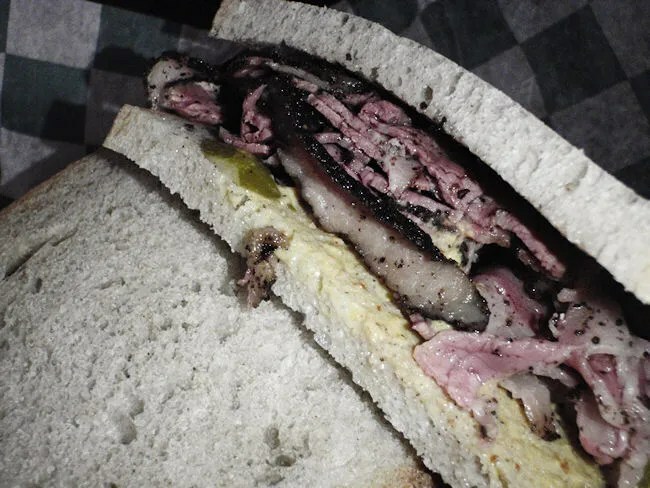 With Pastrami in the name of the restaurant, this sandwich has high expectations. I was kind of hoping for a stacked to the ceiling New York style sandwich. This sandwich is not that, but it is quality, slightly smokey stack of meat with a little bit of a spicy mustard. I couldn’t devour my sandwich fast enough. On my second trip for J, I put in an order for #17 Jessie’s Cheese Please. 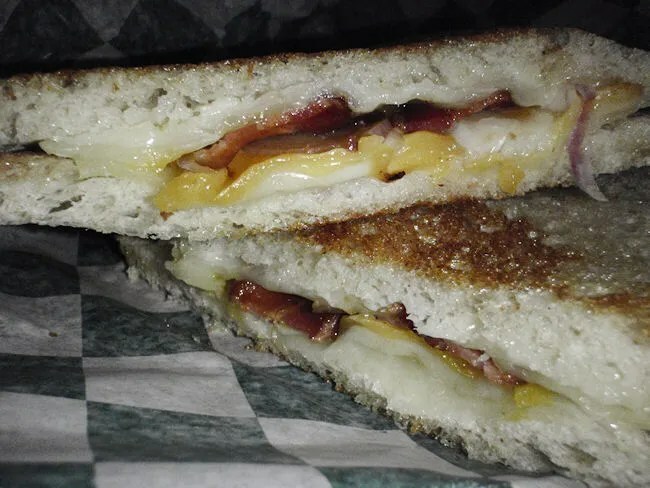 It’s a grilled cheese with a three cheese blend of cheese, bacon, tomatoes, and onions on sour dough. J had me leave the tomatoes off but forgot to tell me about the onions. She said without the onions, the sandwich would have been delicious. She still enjoyed it, but the onions, even after picking them off, were still a little over powering. 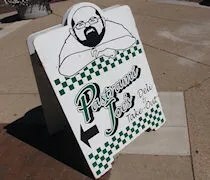 There are many reasons I would like to work at Kellogg, but Pastrami Joe’s is a great reason to be in downtown Battle Creek for lunch. Since I’m usually in Battle Creek at night, I was very glad I was able to make it down there today….even if my initial reason for going sort of boiled my blood.